Just as bridal bouquets are one of the sweet spots of bridal styling, headdresses are elements that convey and highlight the style of each woman. They can highlight or disguise the features of the bride, as well as the colors of the hair and even exalt some details of the wedding dress. Therefore, it is necessary to take care of the shape, color, brightness and size of the headdress. In this article, we give you 4 tricks to choose the perfect headdress according to your wedding dress. Since the princess cut wedding dress is usually bulky (and majestic, of course), small headdresses may be the best hit, although, of course, this depends on the personality of the bride. To preserve a romantic image, headdresses or combs are the most recommended. Mermaid wedding dresses are characterized by being sophisticated and sensual, so that glamorous headdresses are the key pieces of perfection. You can play with different sizes and shapes in the headdress: double headdresses and brooch headpieces reinforce the style of the dress. 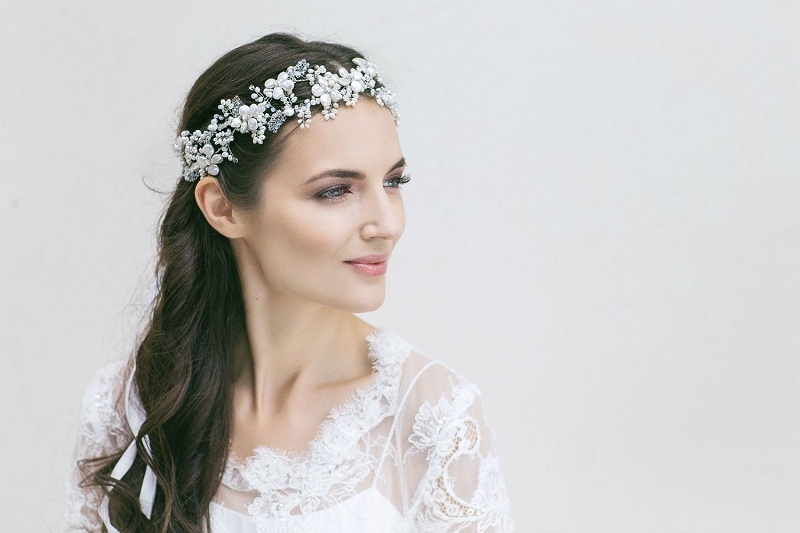 The empire wedding dresses are perfect to be combined with Greek-style headdresses, vintage style and even hairpins and brooches, as these accessories accentuate the essence of the dress. Intense and elegant, are the perfect headdresses will convey the feeling of a whole era. A-line wedding dresses are elegant and simple. Combined with a large headdress will give balance to the image, while with a small headdress the dress will stand out more. A brooch headdress is a conservative complement, but a tiara headdress will achieve a romantic, distinguished and elegant style. The straight cut wedding dresses are discreet and structural; her average orange is the brooch style headgear, which can seal an intense and modern image. On the other hand, to accentuate your bet on short bridal dresses, a flower-type headdress or even a French veil can create a naughty and sweet effect. The rounded and square collars give the wedding dresses classic and romantic aspects, so combining them with a comb-like headdress will create a traditional effect. In addition, they will frame the bride’s face harmoniously. In contrast, the deep and intense necklines, such as the V-neck, the beak and the oasis give strength to the features and appearance of the bride. The hairpin headdress will reinforce this intention. Among the wedding dresses 2018 you will find many necklines that leave the shoulders uncovered, such as tray necks, word of honor and sagging shoulders. 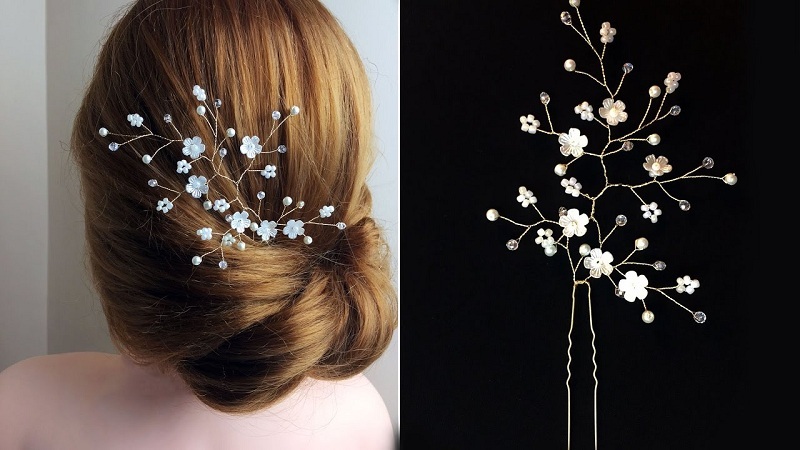 For them, the hairpins and comb are perfect, because they bring a romantic and can be very elegant. A vintage headdress will give a sophisticated twist to the image of the bride, especially if combined with an elegant hairstyle. The neckline heart, romantic as its name, finds its maximum splendor with a tiara headdress. The tiara lengthens the silhouette of the bride and revitalizes her dress, favoring this discreet neckline. The illusion or veiled neckline needs a discreet headdress that does not overshadow the details of the dress and sharpens the image of the bride; the comb or headband headgear gets this effect. For high collars, the comb-like headdress is the best, as it not only lengthens the bride’s features, but fills her image with sophistication and elegance. These collars and the collected hairstyles go together like the night and the moon. The size of the straps or sleeves can be coordinated with the size of the headdress. Brooch headbands, headbands and tiaras can be used to distract attention from the arms and carry it to the shoulders and neck. The hairstyles half picked up intensify this conservative style, but flirtatious. Floral headdresses are perfect to accentuate the style of short sleeves and also direct attention to the top of the head. The flocked sleeves, on their own, need to contrast with more discreet shapes, such as those of comb-like headdresses. For the French sleeves (three quarters), headbands like diadem or tiara provide the romantic and glamorous effect of classic brides. Sleeves with effect, such as flared, butterfly and bat will have a more dramatic effect with hairpin-type headdresses, especially if the hair is left loose. With some of the hairstyles with braids you can also get a vintage image. In the bridal dresses with sleeves, which cover the entire arm, the floral headpieces give a pleasant and sweet effect, while the comb-like ones emphasize elegance and sharpness. Your choice will depend on the extent to which you want to align with the intensity and sophistication of the long sleeve or, on the contrary, contrast with it. To preserve a classic appearance, the nuances of the headdress should be as similar as possible to those of the dress and the veil, although the variations may benefit the features of the bride and her hair. However, the headdresses with color are a unique touch that refreshes and revitalizes the look of modern and romantic brides. It is necessary to look for a balance between the shiny or metallic applications of the dress and those of the headdress, although there are cases in which the excess of brightness generates an organic image. The shiny headdresses are excellent to highlight the features of the bride, so discreet women should choose carefully the placement of these elements. The lace wedding dresses are better combined with discreet headdresses, while the deep necklines are balanced with large headdresses. When the headdresses are placed on one side of the head, a romantic effect is achieved, while in the highest part of the head or behind the neck, the effect is intense and mature. The material of the headdress should also be taken into account: ribbons, feathers, paste, rhinestones, diamonds, and fabric. The materials affect the colors, brightness and effects they cause. You can look for harmonic or contrasting combinations between the materials of the dress and the headdress, but it is important to consider this accessory as unique, before the other accessories. The headdress of the bride is your great ally to convey your personality and beauty, and also can give an unexpected twist to the simple wedding dresses. 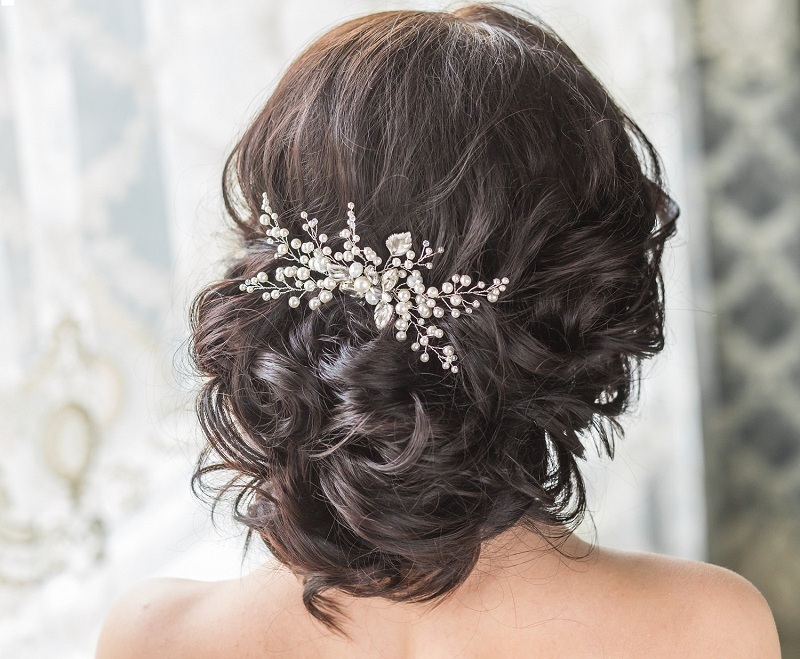 If a balance is achieved between the bride’s hairstyle and the other elements of the look, the image will not only be unforgettable, but will also be perfect. We hope you will like these tricks to choose the perfect headdress according to your wedding dress. We want your comments and suggestions to improve our ideas. Thank you and have a nice day!